Studies conducted on four Michigan Lakes are providing evidence that a break-through, all-natural technology quickly and substantially reduces nutrient overloading – the root cause of explosive invasive weed growth and harmful blue-green algal blooms. The independent studies conducted by Restorative Lake Sciences, LLC on Indian Lake, Paradise Lake, Austin Lake, and Keeler Lake are the most comprehensive analyses ever performed of large-scale use of laminar flow Inversion Oxygenation and biological augmentation in severely impaired lakes. “Though we've witnessed this happening on all the lakes we’re restoring, we are thrilled to have independent scientific data that proves it works” says Dr. William Bledsoe of Lake Savers LLC. The studies provided baseline water quality analyses and measured the decrease in organic sediment, phosphorous, excess weed growth and algal blooms, and overall water quality after installation of the chemical-free technology. On Indian Lake there was a 2 foot reduction in organic sediment (“muck”), a 35% reduction in Eurasian Watermilfoil, a significant reduction in blue-green algae, and a 2 foot increase in water clarity over two summers. On Austin Lake after only 3 months of operation there was a 63% reduction in Milfoil and a 9 inch reduction in organic sediment. On Keeler Lake there was a 48% reduction in Curly-leaf Pondweed, and a significant reduction in sediment phosphorous after only one year. On Paradise Lake Eurasian Watermilfoil was reduced approximately 40% in only 3 months, and 2012 was the first season with no dense canopy of Milfoil covering the surface of the 400 acre West Bay treatment area. It’s also cost-effective. As opposed to expensive yearly chemical treatments which typically increase in dosage and cost over time, and exorbitantly expensive dredging projects, this Whole-Lake Systems’™ approach typically costs less than $2.00 per day per property owner. Lake Savers is a company dedicated to restoring lakes and reservoirs using the world's best all-natural technologies. 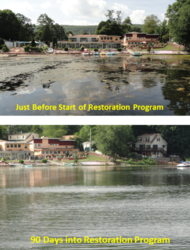 According to John Tucci, President of Lake Savers LLC, "we don't just treat the symptoms, we restore the lake's ecosystem. We've found this systems approach is not only the most effective, it's the most sustainable." To learn more about Lake Savers visit their website.